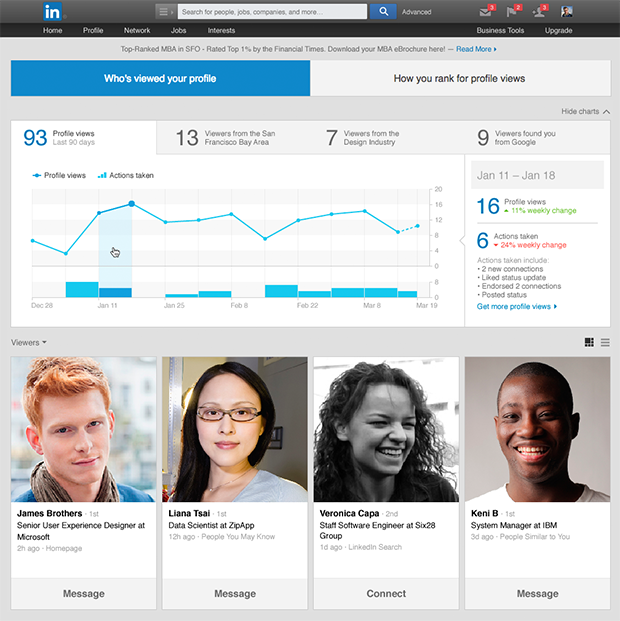 Your LinkedIn profile is the foundation of your professional story. It tells people who you are, what you’re passionate about, and what your goals are for your next chapter. With our network of more than 300+ million professionals at your fingertips, you have the potential for exposure to a massive audience. But how can you make sure the right people are engaging with your profile? What steps should you take to put your best professional foot forward to gain more visibility? Today, we’re launching a new addition to the Who's Viewed Your Profile feature: an additional component to the existing insights graph so that, in addition to seeing who is looking at your profile, you can see which actions you took that led to that specific increase in engagement, including making various updates to your profile, endorsing a connection, joining a group or expanding your network. We know that taking simple actions on LinkedIn is important for profile views. But which action led to an increase in views by the type of people you want to get in front of? Layering who is looking at your profile over the actions you have taken lets you focus on the actions that are most relevant to your professional goals, maximizing the engagement your profile receives. In turn, this increased engagement can lead to more opportunities for you. So, for example, if you are trying to attract new clients or business leads, you can see how many potential partners looked at your profile after you joined an important industry group. Or, if you’re looking for a new job, you can look at your insights graph to see whether adding a skill to your profile or endorsing a peer gave you a bigger bump in views by recruiters. No matter your goal, you’ll be able to see which actions lead to the most relevant profile views - then start reaching out and closing the sale or applying for your dream job. And since your professional brand needs to be maintained in this always-on world, we have also added Who’s Viewed Your Profile to our mobile app. Now you can keep up with who is engaging with your profile - and why - from anywhere. We will continue to build and enhance our products to put you in control of your professional story with helpful information that connect the actions you take to the outcomes you need to achieve your professional goals and be more productive every day. Welcome to the LinkedIn Family, lynda.com!